The Secret Diary of Steve Jobs : Can an iPhone help you get laid? Maybe. 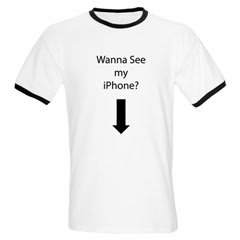 Can an iPhone help you get laid? Maybe. At least the guy who created this T-shirt seems to think so. And no, it’s not one of ours. Dammit. » Have we overhyped the iPhone? Not at all. Well, maybe a little.